These highly absorbent soft menstrual pads are suitable for women who prefer to use reusable cloth pads or have sensitivities to disposable sanitary products. Popolini's reusable sanitary towels with moisture protection are made from skin-friendly, organic cotton and are easy to handle. As the reusable sanitary towels can be used for many years, they help saving money and the environment. Every sanitary towel contains 2 extra absorbent liners which can be inserted when needed. The waterproof coating on the exterior of the sanitary towel protects clothing from unsightly spots. The sanitary towel’s “wings” can be closed with a snap fastener – in that way a safe grip is guaranteed. Each pack contains 2 pads (made up of 1 outer pad + 2 inserts) and comes in its own waterproof travel bag. 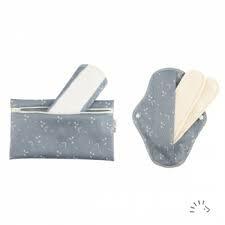 You can choose the right amount of inserts for the absorbency required, pop it into the outer pad, then use as normal.